The German team’s test EmDrive. If you want to send something deep, deep into space, it’s impractical to load it up with lots of heavy propellant. Scientists with their eyes on long-distance space travel have contemplated thrusters that wouldn’t need any propellant at all. The EmDrive, a copper cone that would supposedly push forward on the vacuum of space without any propellant, is one such idea—unfortunately, it’s probably another dead end. The EmDrive is an idea at least a decade old. Last year, NASA actually released a peer-reviewed scientific paper about it, reporting an anomalous thrust. Recently, a paper surfaced by German scientists demonstrating that, well, it probably doesn’t work after all. “We found that, [for example], magnetic interaction from twisted-pair cables and amplifiers with the Earth’s magnetic field can be a significant error,” they wrote. In other words, the measured thrust probably does not come from the drive pushing off of the vacuum of space itself. It might just be interacting with the Earth’s magnetic field. 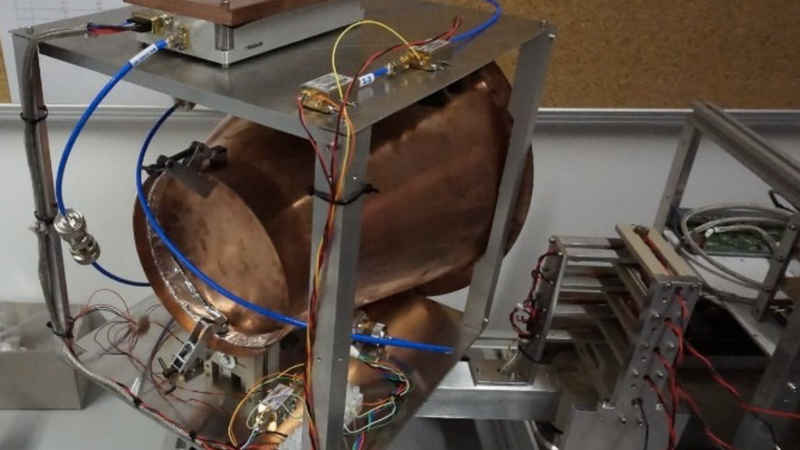 These EmDrive experiments typically consist of the cone connected to a radio frequency amplifier that allows light particles to bounce around inside of it. It’s all put inside a vacuum and attached to a rotating surface and a sensor to detect whether the cone moved or not. The way it’s supposed to work is that the cone experiences different pressures from the light on either end, and then moves forward. So, a team at the Technical University at Dresden in Germany repeated the experiment. They, too, noticed an effect—but the tiny thrust was measured regardless of the experiment’s orientation. They thought that the interaction between their setup and the Earth’s magnetic field probably accounted for their measurements. Any thrust would have to be weaker than that interaction. They did, however, see a tiny amount of thrust while testing a Mach-effect thruster, which involves crystals with applied electromagnetic vibrations that lead to tiny mass shifts and small thrusts. The researchers couldn’t rule out that some outside effect was causing the thrust in this case, too. This could feel like another blow to the EmDrive’s feasibility, but the thruster model isn’t likely to go away soon. Last we checked, China is still working on testing a similar radio-frequency-cavity thruster in space. The German team will continue testing differently shaped cavities with more applied power. It’s nice that scientists are looking for ways to push things through space without fuel. Propellant is a heavy thing to bring along, and interstellar travel requiring lots of jet fuel isn’t feasible. Other propellant-less options, like solar sails, have low thrusts that may not work for heavier spacecraft. Whatever thruster scientists design, however, it will have to obey the laws of physics just like everyone else.